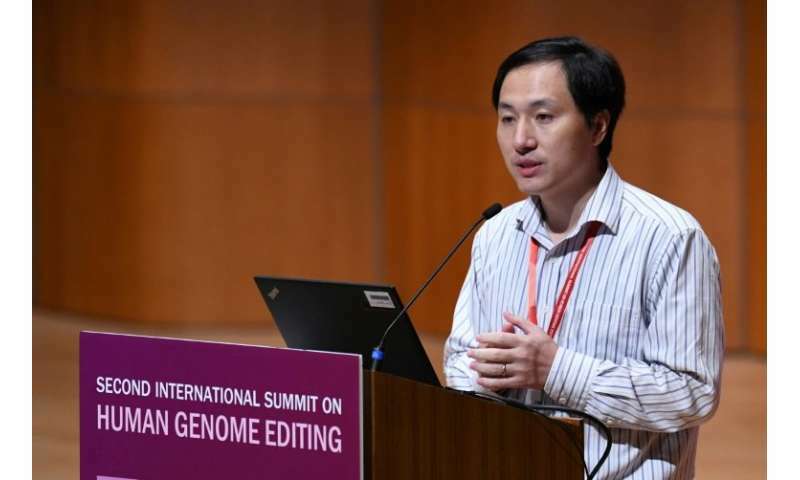 The Chinese scientist who claims to have created the world's first genetically-edited babies said Wednesday the trial had been paused, following an international outcry over the highly controversial procedure. A total of eight volunteer couples—HIV-positive fathers and HIV-negative mothers—had signed up to the trial, with one dropping out before it was halted. He said there had been "another potential pregnancy" involving a second couple, but when questioned further agreed it had been a chemical pregnancy—a term referring to a very early miscarriage. The conference has been upended by the gene-edited baby revelations claims, after university professor He posted a video claiming the twin girls—born a few weeks ago—had had their DNA altered to prevent them from contracting HIV. Editing human embryos can create unintended mutations in other areas—so-called "off-target effects"—which can be carried through to birth, experts warned. There is also a history of fraud within China's academic community—including a scandal last year that led to the withdrawal of 100 "compromised" academic papers.